Demonstrators were out in droves again in Baltimore, Maryland as of Tuesday afternoon before a week-long curfew starts being enforced, implemented after the overnight riot following the funeral of Freddie Gray. 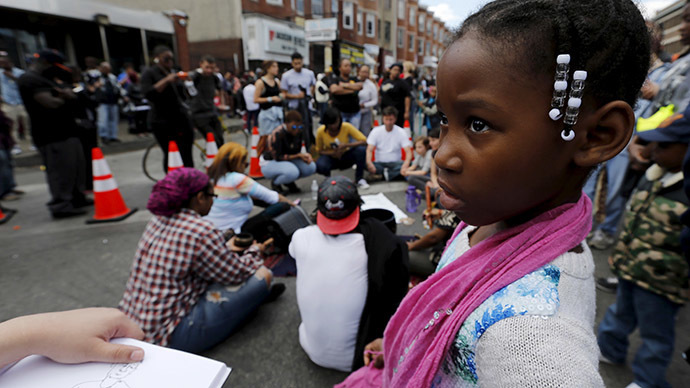 Hundreds of demonstrators were on the streets of Baltimore early Tuesday afternoon, hours before the curfew was scheduled to begin, singing and dancing on the streets in sharp contrast to the violence that unfolded the previousevening. A city-wide curfew will go into effect across Baltimore beginning Tuesday evening at 10:00pm ET. Baltimore Police Capt. Eric Kowalczyk said during a press conference that the city will enforce the curfew and added, “unless you’re engaged in work or on your way to receive medical treatment, you are not allowed to be out.” At the same time, Kowalczyk acknowledged the demonstrators that have stayed peaceful and said it was “very important not to lump all of the criminal activity that takes place in the city into one." RT'sAlexey Yaroshevskydescribed the intersection of North and Pennsylvania Avenues as a “very tense place to be”Tuesday afternoon. According to the Mayor's office over 20 arrests were made during the night of protests. 144 vehicles and 15 buildings were on fire. Maryland Governor Larry Hogan activated the National Guard on Monday evening after Baltimore Mayor Stephanie Rawlings-Blake requested assistance as chaos erupted in the afternoon following the funeral for Gray, a 25-year-old black man who died earlier this month from injuries sustained while in police custody. Baltimore officials say that roughly 200 people were arrested on Monday evening and that more than a dozen police officers had been injured. At a press conference at the White House on Tuesday afternoon, President Barack Obama addressed the violence that unfolded barely 50 miles away in Baltimore. “There’s no excuse for the kind of violence that we saw yesterday. It is counterproductive,” the president said. Obama went on to oppose what he called the latest “senseless violence and disruption” to unfold in Baltimore, and said it was not a protests but rather “a handful of people taking advantage of a situation for their own purposes” that he believes should be treated as criminals. Moments earlier, Gov. Hogan said at a press conference that "a couple thousand new police and guards”are on the street in Baltimore as the city prepares to instate a curfew later in the evening. Meanwhile, officials have closed city public schools, postponed a Major League Baseball game scheduled for Tuesday evening at Camden Yards and begun attempting to establish calm after a fiery night of riots caused dozens of vehicles to set ablaze. “Criminal activity will not be tolerated,” Hogan said. During Tuesday’s presser, however, officials acknowledged that authorities had indeed been continuing to issue arrests into the afternoon and would be investigating reports of looting and other criminal activity. The Baltimore Police Department said they plan to provide updates to the media throughout Tuesday as demonstrations continue.